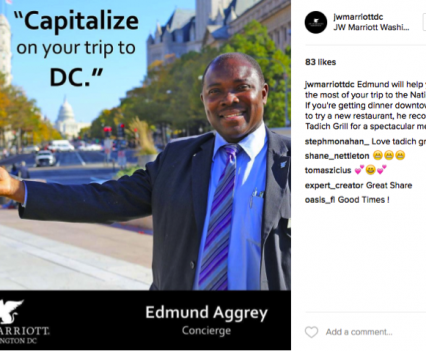 Situated just blocks from the White House and the National Mall, JW Marriott’s first and flagship location in Washington, D.C. is a love letter to its namesake and the nation’s capital — and needed a social media and content strategy to match. Our client wanted to take the hotel’s branded content to the next level, increasing the variety and creativity of posts while adhering to established elegant, luxurious and distinctive brand standards. They needed an agency with intimate knowledge of Washington’s best attractions and today’s most relevant travel influencers. Our goal: Use content and a strategic distribution strategy to elevate awareness of and engagement with the brand, particularly among a millennial audience. We put an editorial strategy in place to plan and develop custom branded content for distribution across the hotel’s Facebook, Twitter and Instagram accounts while leveraging the latest, most innovative platform tools and features. 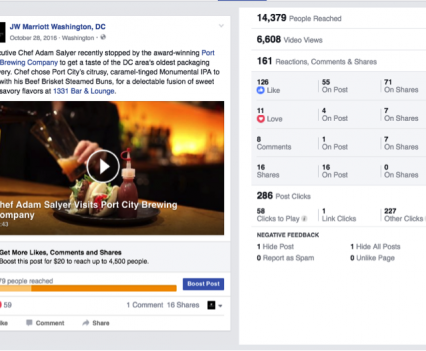 We also launched Post Engagement and Clicks-to-Website campaigns through Facebook and Instagram to promote our content, seasonal booking deals and hotel events. Using original and user-generated photography and videos, we created impactful content that aligned with JW Marriott’s core values: Authentic, Crafted and Intuitive. From culinary hotspots for the traveling foodie to outdoor activities for fitness enthusiasts, we effectively highlighted the unique amenities and spectacular location of the hotel to prospective guests. We used the newest features available on each social platform — such as 360-degree photos, Boomerang videos, Facebook Tabs and Instagram Stories — to better communicate the brand’s tone, voice and visual identity through innovative formats that would appeal to the millennial target audience. 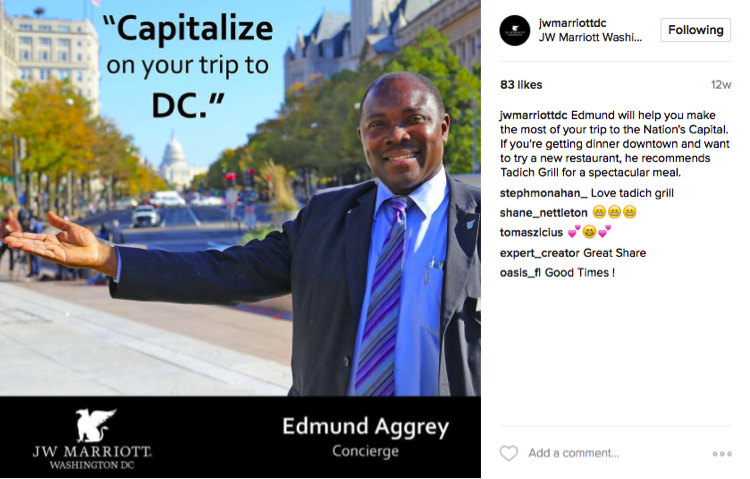 To build and foster an engaged online community, we monitored JW Marriott DC’s social channels daily, responding to and engaging with prospective travelers, past customers, influencers and location-specific pages within the Marriott Hotels portfolio. 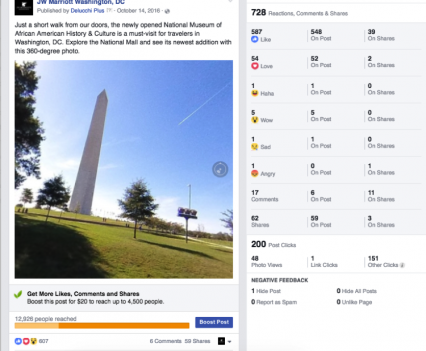 To support our content efforts, we deployed Page Like ad campaigns to further grow our Facebook fan base. Using Post Engagement, Page Like and Website Click campaigns, we drove qualified traffic to our online and social channels. Using demographic and advanced behavioral targeting, such as “Likely to Travel” and “Traveled in the Last Month,” we identified and served content to the most relevant audiences that fit the JW Marriott target customer, with campaigns that 1) grew our fan base, 2) expanded the limited organic reach of brand content, and 3) sent qualified traffic directly to Marriott’s booking site. 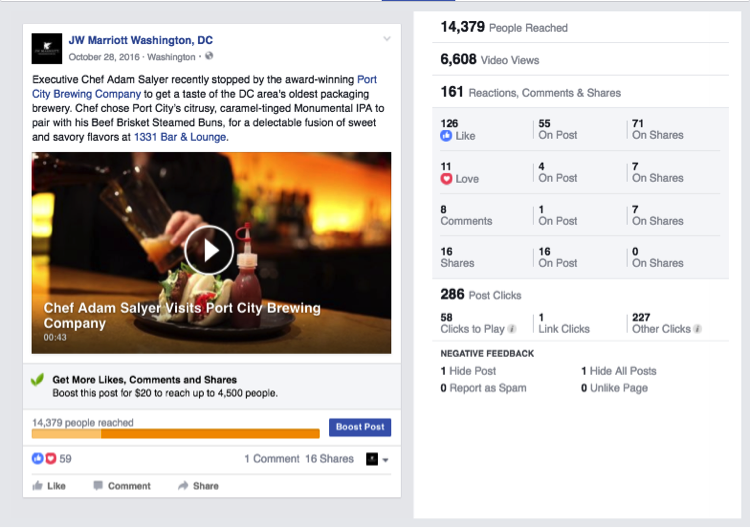 In our first year partnering with JW Marriott DC, our content has reached over 1 million people and generated almost 100,000 engagements across Facebook, Instagram and Twitter combined. 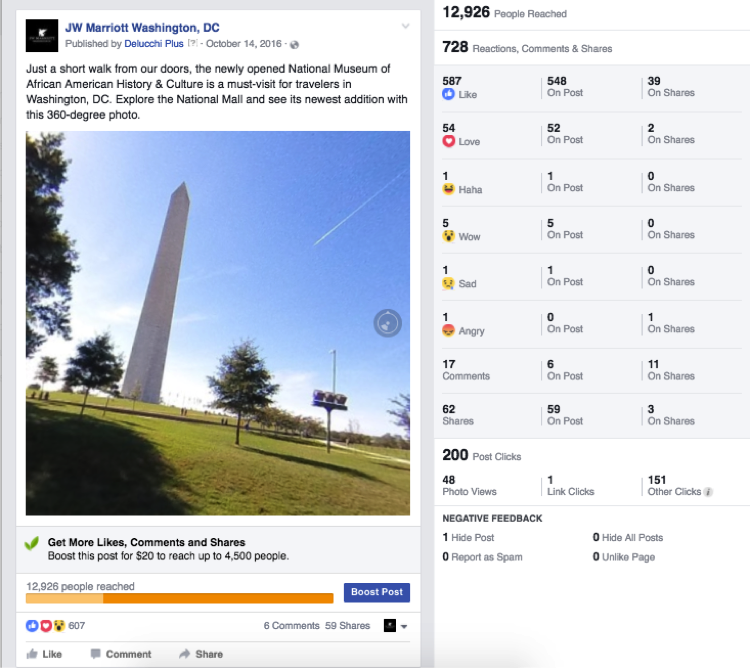 One of these pieces of content was the best performing post in the page’s history: a 360-degree photo at the National Mall around the grand opening of the National Museum of African American History and Culture reached almost 13,000 people and produced over 900 engagements. Our monthly videos — which feature JW Marriott DC team members and executive chefs, local businesses, farmers markets and popular seasonal activities in D.C. — garnered more than 70,000 video views between January 2016 and March 2017.